Himesh stupid and naive. Who told him to be so honest about himself on the show. Everything was going fine, he was talking about his film and his family…especially about his mother. Then suddenly I went….what!!! Did he call R D Burman and Saighal a nasal singer? He is crazy, he don’t know how to represent himself. He should have seen the Akshay and Anil episode, they both were so honest and real on the show but same time so convincing and funny. And with Himesh, I think he was honest on the show but don’t know why he was not convincing and funny. He agreed that he has done no hard work and no struggle at all, everything he has is gifted to him by some divine force or is his destiny. And that he sing from his nose. Finally the truth about his topi was revealed, when he called himself “Takla”. I don’t know what people really liked in his film “Aap Kaa Surroor”? There’s nothing hatke in it. What has happened to our audience…….wake-up people!!! Karan: Firstly, congratulations on the super success of your film… I know a large section of the industry was surprised, but were you expecting this kind of success? Himesh: I think, I just believed in God, destiny and somewhere I think everyone just prayed for me and that is something that worked for me. 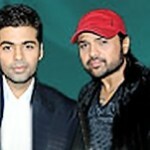 Himesh: No, no… only that 1 %… people just felt that this cannot happen, a singer not a very good looking guy. Karan: Not conventional looking not hero material? Himesh: I think you are being nice to me… but, it was something that was unprecedented… when the film started, people did say, paagal ho gaya hai. I understand. But, when actually the film was declared a hit… then, people realized. Himesh: The first year, I really didn’t feel that I need to defend… when my first song Aashique Banaya came… they said ‘nasal’ and I said ‘high pitch’… and I think they got angry because of that… because I said, ‘nahi, high pitch hai… main high pitch mein gaata hoon… main nasal nahi gaata hoon“. I should have accepted that, ‘Theek hain yaar… naak se gaata hoon“. For the first year, I really tried to defend… I don’t know, why? I don’t think they were really against me… they wanted me to accept that, “I am a nasal singer”. Karan: You were trying to defend your talent? Himesh: Not my talent… but, why are you calling me nasal, and why are you not calling the other singers nasal, who are nasal. Karan: What kind of singers are nasal? Karan: You didn’t mean to offend him? Karan: But Himesh Reshamiya ko gussa kyun aata hain? Himesh: Gussa tab aata tha. Karan: Maine aapko stage pe dekha tha… once on an award ceremony… you were very angry… when you went to receive the award… you were upset with people… what was making you so angry? Himesh: No, when I started singing… they really started getting more work… because I started accepting films in just about 6-8 months… I left 16-18 films… and I am not doing outside films… I am just doing 3 films a year… and for the Producer and Director who sign me as an actor. Karan: But you stopped using other male singers… you were singing. Himesh: No… I used Rahat Fateh Ali Khan saab, Zubin … and all of them… I have been using a lot of male singers… the only thing is that there may have been some kind of jealousy… because they felt that they are more talented than me. Karan: Do you think, they are more talented that you? Karan: There were particular people, who were somehow targeting you… is there any one kind of person that you felt resentment towards? Karan: You don’t harbour any kind of negativity for people? 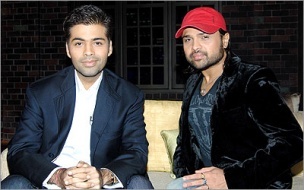 Himesh: No… No… I really don’t… because I understand that from their point of view… if I would have been in their place. Karan: You would have said the same? Karan: Would you at all say that you wanted to win the class audience… in terms of the class film makers… because you worked with a lot mainstream people… but, the bigger banners eluded you? Himesh: Bigger banners… maine try kiya Karan… unko phone bhi kiye… maine apko kitne phone kiye… Please aap mujhe ek baar chance di jiye aapke film mein kaam karne ka… but, main yeh samajh raha tha.. main us waqt 30-35 films kar raha tha… toh woh jo teen chaar bahut hi top ke banners hain… jo bahut exclusive stuff karte hain… unke liye bahut odd tha mujhe lena… main ye samajh tha ta.. par phir bhi main apni taraf se koshish kar raha tha… jab waha pe mujhe nahi mauka mil tha tha… aur yaha par yeh log mujhe kaam de rahe the… to main unko kaise bhool sakta tha. Karan: You stood by those people? Himesh: Yes… 100% aur rahoonga… kyuni, woh log mujhe kaam de rahein hain… aur mujhe apna talent dikhane ka mauka inhi logo ne diya. Karan: It is because of them? Karan: But, do you feel that you want to get that class? Karan: That 1% that you are not getting? Himesh: Yes… I want to and I will… aur mujhe pata nahi… aise lagta hain ki bhagwan sun lega aur woh 1% bhi mere saath aa jayega. Karan: What about your alleged problem with someone like a talented singer like Sonu Nigam… What happened there? Karan: You had not said that? Karan: Have you heard that behind your back there might be other singers who might be making fun of you? Karan: Aapki jo film thi… woh Apne aur Awarpan ke saath release ho rahi thi… aap dar nahi gaye the… yeh nahi socha ki… I should change my release date? Himesh: Absolutely… aur astrologically bhi kaha gaya tha ki yeh date aap ke liye achchi rahe gi… main January mein hi keh chukka that ki… mummy ke birthday ke din… film release karoonga. Karan: Himesh… what happened with Salman? Karan: Who apka pehla break tha? Himesh: Aur uske baad bhi… unhone mujhe jo support kiya… actually koi problem nahi hain… but, pata nahi yeh baat kaise aa gayi… aur film ke baad bhi unhone mujhe phone kiya… there is no problem. Karan: General perception is that he was there for you initially but, now there is a distance between both of you. Himesh: Yeh baat galat hain… aur aap yeh baat Salman Bhai se bhi poochenge to woh bhi yahi kahenge. Karan: Aap yahan aakar kafi smile kar rahe hain… but projection kyun hain ki… Himesh Reshamiya doesn’t smile… yeh apka khud ka projection hain ki… you made sure you are projected like this? Karan: There are few things that are your signature… like you said… you’re nasal quality of singing… the fact that you are intense… also your cap, what’s the mystery about that? Where did that come from? Karan: And the cap stuck on to you? Karan: Laughs… woh hi mera next sawaal tha ki… Was it to hide something? Karan: So, why didn’t you like… so, many other heroes are loosing hair… and are doing things? Karan: What do you think of you as an actor? Karan: But, do you think you are a good actor? Karan: But one thing is… you keep very quite about your wife… you don’t talk about her? Himesh: Because she is a very simple girl. Himesh: No, the first time that I was asked whether I was married… I said Yes. Karan: And you have a son? Himesh: His name is Swayam. Ranbir and Kareena on Karan Johar’s show? He is a Singer. He KNOWS how to sing, and say anything, he is a huge success. I AM A BIG FAN OF YOU……. I LKE UR ALL PICTURES…..
You are simply the foolish person on the earth. New cheez ko log dheere dheere…. samajh sakte hain ! If you think yourself to be more capable then our rockstar Mr. Himesh Reshammiya Ji, then go to Mumbai and do something new in music,singing,acting and whatsoever you think you are capable of ! I think you are completely jealous of our rockstar success. Don’t dare to do this silly mistake in the website ! We can’t tolerate criticism against THE HR Ji! You don’t even know your stupid website can banned by us and our tight secure community ! I don’t care whether you publish my coment or not ! But take care of yourself also! Nautaanki baaj nahi K ! The Closest person to the Himesh Ji!